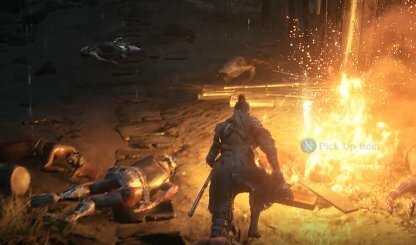 Check out this Sekiro: Shadows Die Twice guide and walkthrough for Estate Path ~ vs. Shinobi Hunter Enshin of Misen. This includes boss fight tips, gameplay hints, techniques, & tricks! The compound has numerous sections with multiple enemies spread across it. 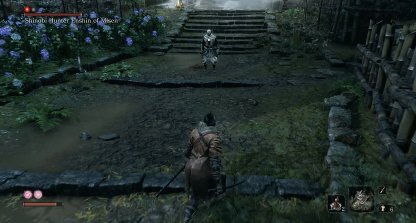 You don't need to defeat all the enemies to progress through the area. Only fight the ones that are in your direct path. 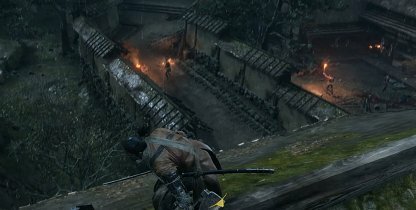 There are multiple walkways and grapple points that you can utilize to scout out enemies. From above, you can do assassinations then leave and hide if enemies come after you. There is an Offering Shrine to the right of the doorway in the compound. 2 enemies will be directly in front of it. Kill them and open the Shrine to get the Shinobi Axe of the Monkey. 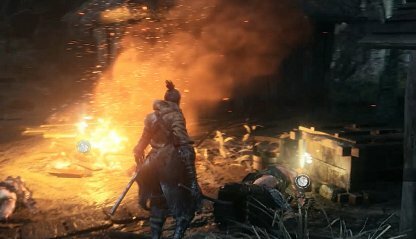 To the side of the compound, right before the staircase with the wounded man, is a fire pit with numerous enemies around it. Beat them all to get access to the Flame Barrel right in the middle of the fire. 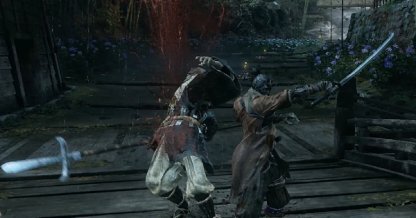 At the end of the compound will be 2 shield-wielding enemies. 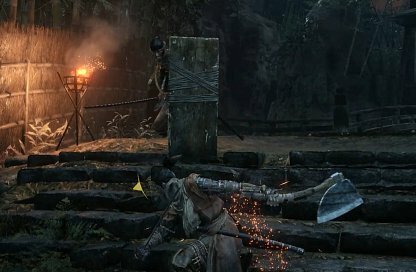 Defeating them will require the Loaded Axe so travel back to the Sculptor to attach the Loaded Axe after you get the Shinobi Axe of the Monkey. Near the fire pit where you find the Flame Barrel will be a Mibu Balloon of Wealth. The Pellets are a bit further from the Fire Pit, but they're in the same general area. The Dousing Powder can be found right next to the Fire Pit as well. It's on the other side of the pit. 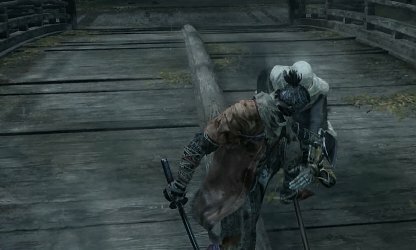 Make the fight against the Shinobi Hunter Enshin of Misen easier by taking down the guards around him first. There will be 4 of them spread across the area. Lure them out for assassinations or one-on-one battles. Ensure that you are at your best when fighting against the Shinobi Hunter Enshin of Misen with all of your health gauges and resurrections. This will ensure a better survival against your fight with him. 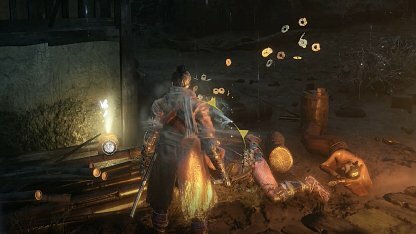 The Shinobi Hunter Enshin of Misen will have 2 HP Nodes, requiring players to perform Deathblows on him twice. Sneak around him through the Flower Bed to be able to assassinate him and take down a node of his health. Most of the Shinobi Hunter Enshin of Misen's attacks can be countered with the Mikiri Counter. When he's about to lunge, his spear will spark and a Kanji sign will appear on your head. Press O to perform the Mikiri Counter and attack him while he's vulnerable. Check Out Best Skills To Unlock Here! 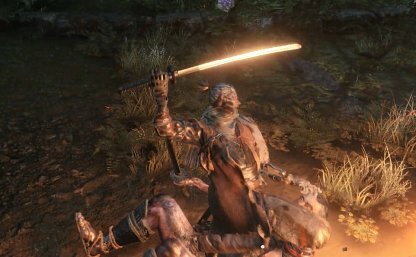 You'll only be able to break the Shinobi Hunter Enshin of Misen's Posture once you've done enough damage on him. Be patient with your attacks and pair them with the Mikiri Counter to bring down his health enough to perform the final Deathblow.